It's been raining off and on here since Thursday. The first storm delivered high drama with lightning and thunder so severe that local beaches were evacuated. Friday night through Saturday delivered heavier rain as part of what the weather forecasters call an "atmospheric river," which caused flooding and mudslides. My own area was relatively unaffected, although falling trees are an ongoing concern following heavy rains here and the rain still hasn't stopped. More rain is expected through Tuesday. It was coming down hard enough on Sunday morning to dampen my interest in collecting material for "In a Vase on Monday" (pun intended). 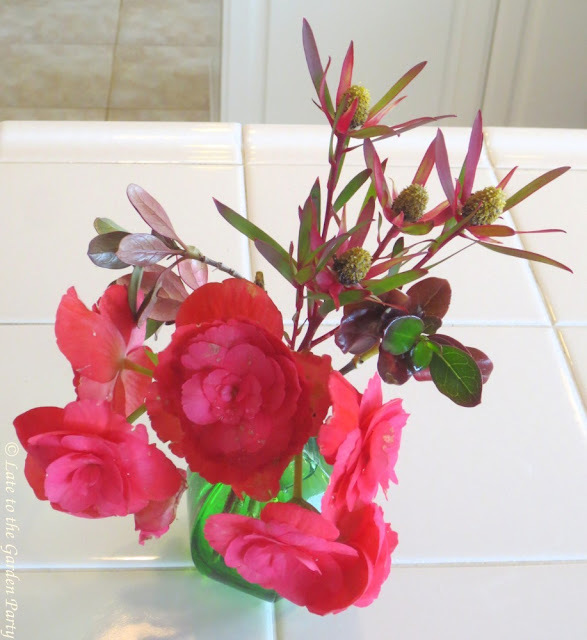 If I'd had any sense, I would have cut flowers late Sunday afternoon when there was a break in the rain. I didn't but I had noted some prospects for cutting so I zipped through my garden grabbing up what I'd identified earlier and made do with that. And I still have two vases this week! The first one features two early blooming calla lilies. The calla lilies came with the garden and most grow on my horrid back slope. The plants die back in late spring but return with the rain each winter. Last year, few bloomed but I'm hoping for a better turnout this year. 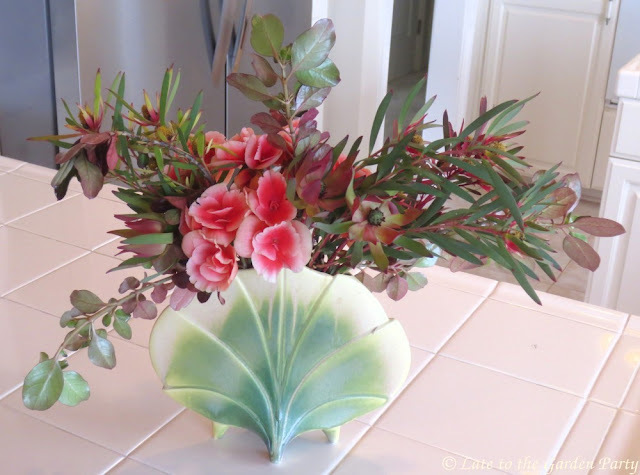 The second vase was composed around the blooms of a begonia I picked up in the course of a visit to Ventura the weekend before last. Once again, I had leftover stems that I popped into a tiny vase. The flower here is also Begonia x hiemalis but this one is a solid coral color. Sans its original Camellia blooms, the blue and white arrangement I created using Echium and Dianthus last week still sits in the front entryway, while the new vases took up other positions. I'd hoped to create a vase using the first Freesias to flower but, with rain coming down in bursts, I shelved that idea. Maybe the Freesia stems currently in bloom will still be in shape to use next week, or prompted by the rain, maybe others will be flowering by then. While I know many gardeners in the Northern Hemisphere are shivering from the cold, the rain here has delivered the promise of spring. I'm checking the garden every day for new arrivals. Visit Cathy at Rambling in the Garden to see what she and other IAVOM participants have found to fill vases this week. Some of my flowers handled the rain better than others, Amanda. My lovely Camellias have been battered but both the calla lilies and the begonias were completely unscathed. Best wishes for warmer weather in your near future! You so often do displays where the foliage or flowers fan and arch outward. I always love them and must try to remember to do that myself. I tend to be more vertical I think. Even here when we got lots of rain, it gets worrying about the stability of trees even big ones. And esp. the ones next to the house! Yes, trees near the house can be a major worry. The eucalyptus here have a reputation for coming down unexpectedly. That was one reason I caved on taking down the eucalyptus targeted by my neighbor in 2013. It was less than 8 feet from the house. Maybe you can find some plants to hide the ripening foliage of the Freesias, Denise. A lot of mine are tucked below larger shrubs and don't stand out except when in bloom. 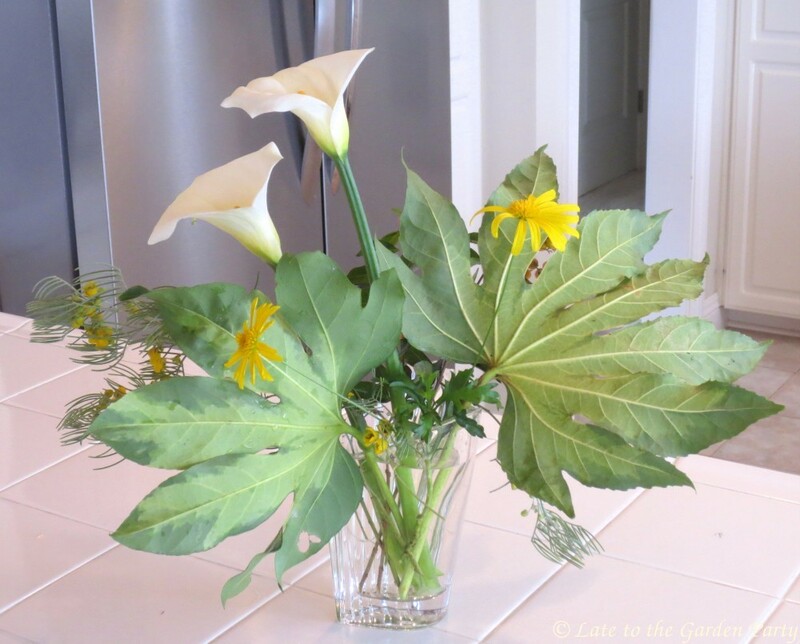 Oh those callas are gorgeous Kris! The rainstorms must be getting tedious for you. It would be nice to have a weather moderation app! I remember seeing a movie in which an evil villain hijacked the weather for dubious purposes so, much as I'd like to parse out these rainstorms over a longer period, I wouldn't trust even myself to manage the ripple effects appropriately! The bobbly orange things are the berries of Duranta 'Gold Mound', a shrub I've used in several areas. I think this may be the first time I've used them in a vase. You may see them again if they hold up well in a vase, Cathy. Those pink and red begonias look like little roses or camillias. Sweet. I can even grow a calla lily. I have a yellow one that gets really tall. I wonder though if it will live through this winter since we have had several below average temps and lots of ups and downs. I love the bouquets today. I can see each flower and the greens. Simple is sometimes best. I was really surprised when I saw the calla lilies appear here, Lisa. I'd always thought the plants need a lot of water but, as long as you accept their disappearing act in late spring through early fall, they're great. They say if you water them, arums stay green year round. But it is more interesting if they are summer dormant and a sign of autumn. I was used to seeing the calla lilies growing year-round in other people's well-watered gardens, Diana. when they popped up from nowhere on my back slope I was surprised and when they bloomed I was delighted. I'm thrilled to find they'll come back with the rains. I only had a couple of blooms last year when rain was minimal but I'm looking forward to a better show this year. Love them both! 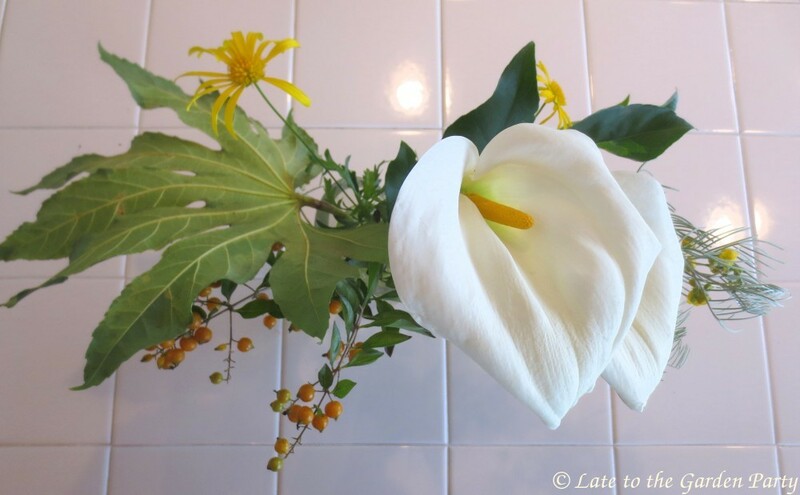 How wonderful to have Calla Lilies, we have Duranta berries here and I did not recognize them! great use of the berries. 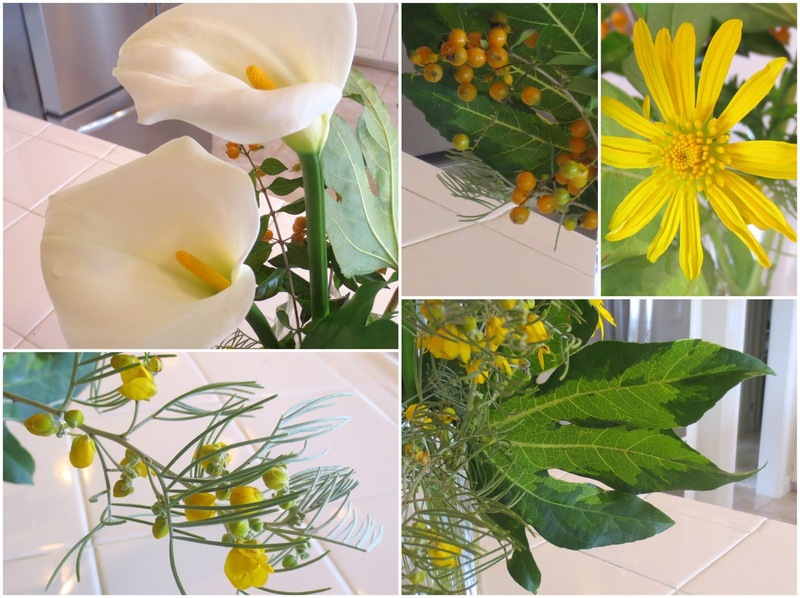 I think the arrangement in the Ginkgo vase is your best ever for that vase, wonderful combination. The Begonias I cut don't last very long. Happy Monday. Cheers to rain! I cut a single begonia stem but divided it in 3 pieces to fit into the vase so I'm going to have to watch the arrangement closely to ensure that the water level remains high enough to keep them hydrated. That said, I can't recall ever using the flowers in a vase so I've no idea how long they'll survive even if kept well watered. I love your Calla Lilies - they look like they are made of thick cloth of the purest white. And that begonia with the leucadendron is wonderful, the match is perfect! I've learned that, if I look around carefully enough, I can almost always find appropriate accents for any flower - even if I'm being battered by rain! Thanks, Amy. I'm pleased to report that those Duranta berries are holding up in the arrangement thus far. It's nice to have berries that retain their orange color instead of turning red. I've never been a fan of begonia but the colouring on this pink one is just beautiful and perfect with the Leucadendron of course. How happy your plants must but it seems there is always a worry too with your weather. I guess no one can take weather and its effects for granted. I'm sure I'll be complaining about the hot, dry conditions again all too soon. Again two fabulous arrangements Kris....the one with the white lilies stunning. I love the bits of yellow. You do have some wonderful shrubs to give the greenery..not always green if you get my meaning. All the best and thanks for sharing. Although I can get fixated on flowers at times, Noelle, I given a lot of thought to the foliage plants in my garden too. And, yes, there is a lot of it that's chartreuse, burgundy, purple or variegated. You must be thrilled to have so much rain even if it does curtail your gardening activities. I'm interested that the Calla lily does well on your slope. I always think of them as pondside plants wanting their feet in water. If they grow for you I will think of adding some here as I love the blooms despite their being associated with funerals in my mind. I had the same impression of calla lilies as water-hungry plants, Christina, which is why I was so surprised to see them pop up in this garden, on my neglected, dry back slope no less! Like some other bulbs, it appears they can get by with an extended dry period as long as they get sufficient water during the winter months leading into their bloom period. I expect mine die back much earlier than those in areas that get more water but this cycle fits my garden nicely. 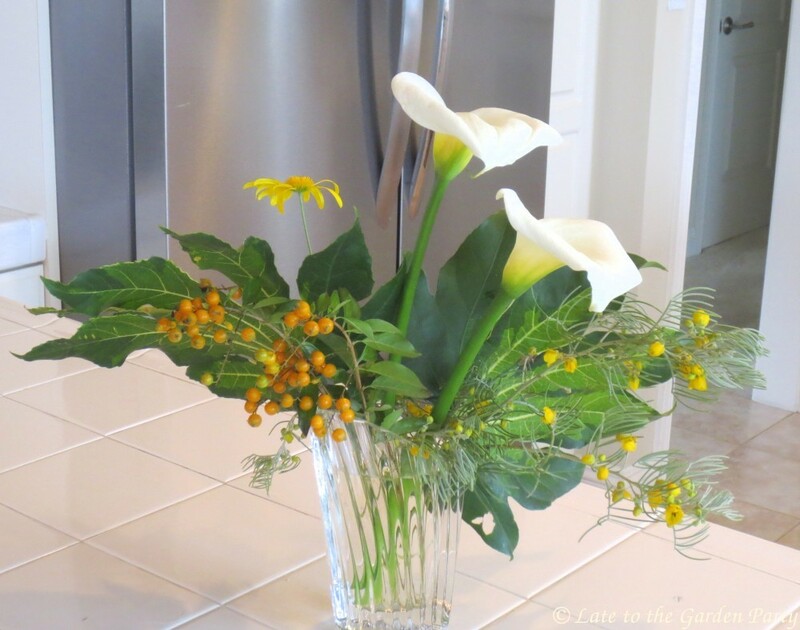 Wishing you many more calla lilies! They are triumphant in your arrangement. 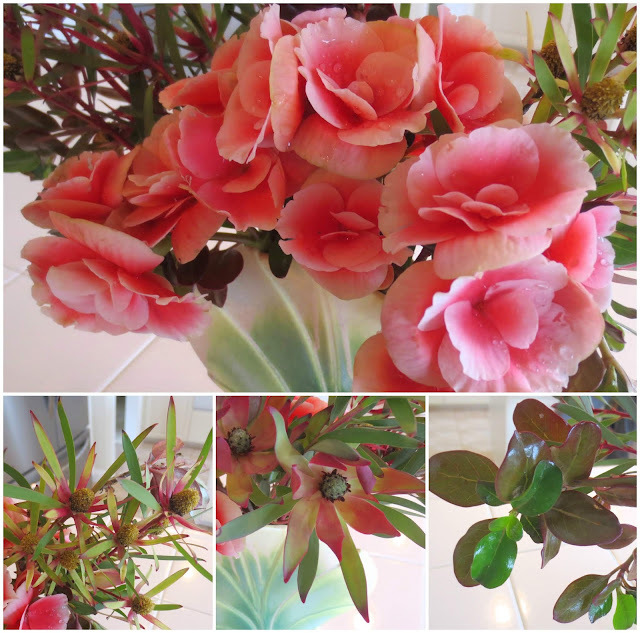 I am with everyone else in saying I don't usually like begonias, but ... it works so well here with the leucadendron. Looks a bit like godetia I think. The two-toned color of that begonia was its main attraction, Allison. It's tucked in my lath (shade) house, which has given it some protection against the heavy rain. Kris, the pink begonia is a stunning beauty! I have never been able to keep tuberose Begonias alive (snails and slugs find them irresistible) but now I want to press my luck and see if I can keep them alive for next spring! You need some raccoons in your garden, MDN! Does Argentina have those? They can be very destructive in the garden but they do a good job at taking care of snails and slugs. I do use snail killing granules in many areas following rainy periods when those slimy pests appear everywhere, though. The brand I use isn't toxic for people or pets. Strange to hear of you having all this rain. Calla lilies always look so expensive. 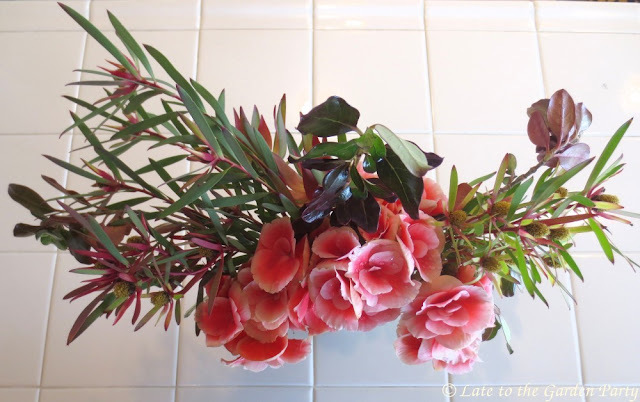 I love your second arrangement too with the lovely begonias and gorgeous vase. Winter is our rainy period and, under "old normal" conditions, we'd get nearly 15 inches per year, with most if not all of it coming during our cool season. By that criteria, our current total to date isn't all that unusual, although it seems off that it's coming in blocks over continuous days this year. I'd previously thought El Nino was responsible but according to NOAA El Nino has been stalled by another weather factor (MJO) so I'm not altogether clear what's happening either. It's still possible that El Nino will impact us in early spring too. Floods, mudslides and downed trees are a fact of life when the rain falls here. The biggest danger is to the recent burn areas as there's little to nothing to hold the soil when it becomes saturated. Sodden but wonderful. Some small fallen trees in this neighborhood, but none of the big dead Eucs--yet. One wind event would do it. Love the Callas! I hope they bloom like mad for you. I've only heard of one big tree coming down on the Peninsula during this last series of storms but one closed the main road in and out of here for a time during the prior set of storms. And you're right, it's the wind that tips the scales. Sorry you're getting so much rain all at once. 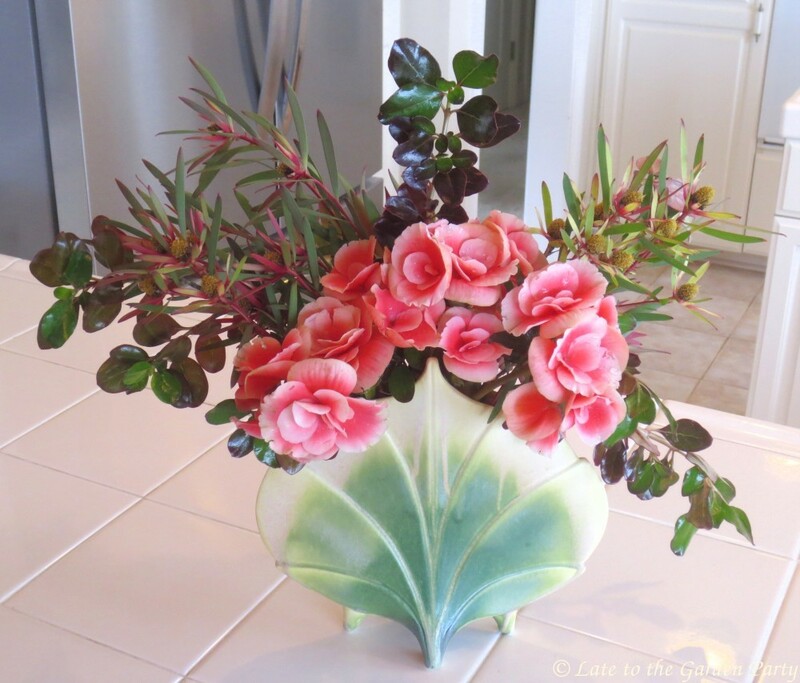 Love, love, love the way the pink begonias pop against the green of your green ginkgo vase. That bi-colored begonia seems to be a hit this week, Peter.